Cheong-ah Hwang, "Captain America," 2010, paper. The Pearl Fincher Museum of Fine Arts is pleased to present My Hero! Contemporary Art & Superhero Action, an exhibition for all ages that examines what it means to be a superhero and celebrates the possibilities of superhuman power. This intriguing collection features work by contemporary artists from around the world, working in a variety of media including sculpture, printmaking, and photography. Revisit familiar characters such as Superman, Spider-Man, and the Avengers in a new lens this summer at the Pearl! Exhibition programming includes Museum Family Days on the second Saturday of the month, Drop-In Art Wednesdays (free art-making program) from 3-4pm every Wednesday afternoon in the summer, and week-long "Heroes & Villains" summer camps for kids ages 8 and up. My Hero! Contemporary Art & Superhero Action was organized by Carrie Lederer, Curator of Exhibitions, Bedford Gallery, Lesher Center for the Arts, Walnut Creek, CA. Read more about the exhibition from the curator below. Our modern-day superhero is the ultimate champion—an idol that destroys the bad guy, protects the innocent, and saves the day or sometimes the world. Our superheroes are usually humble guys and gals, tucked-away and living anonymously, until these vigilantes are called to suit-up, don a mask, and face the dark side, fight evil, and right the wrong. For decades, artists have tapped the world of the superhero, eager to explore the alluring concept of what it means to have an avatar. We’re captivated by their miraculous, superhuman strength, startling bravery, enthralling adventures, and even their weaknesses. A number of artists are also asking: What happens when Superman gets old and checks into assisted living? What does he look like and what’s he up to? An unassuming and amusing drawing by New York artist Jason Yarmosky titled Playing Cards,narrows the focus on this sobering idea with his endearing image of aging superheroes gathered around the card table playing a badass game of Poker. Swedish artist Andres Englund continues the narrative with images of his droll, forlorn and exhausted superhero, who—after a lifetime of saving the world—is brought to his knees, literally. This superhero, craggy but tough, is a Boomer feeling his age. Jason Yarmosky, "Playing Cards" from the "Elder Kinder" series, 2015, pencil on paper. My Hero! presents a sprawling collection of artworks by artists from around the world working in a range of media from painting and sculpture to printmaking and photography. Some of the artworks in My Hero! are very funny and very clever—including those of Jenny Parks, who creates images of cats (many of which have gone viral) suited-up as superheroes and ready for battle. Laurina Paperina makes delightful cartoon-like narratives that are drenched in satire and address the daily emotional struggles of being neither a superhero nor super-cool. Jenny Parks, "The Catvengers," 2013, digital print. Other works in the show reimagine iconic superheroes, celebrating the magic of the genre with a personal, social or political narrative. 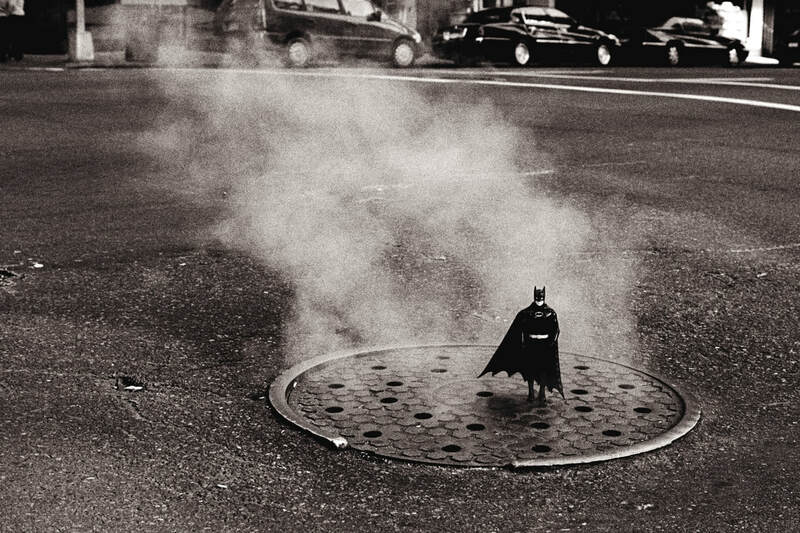 The black and white photographs by French artist Rémi Noël depict a Batman doll in dreamy noir-like scenarios—at a low-end motel, atop a steamy manhole cover, or considering a quick stop to a gentleman’s club. Brooklyn artist Dulce Pinzón makes photographs depicting the lives of immigrants as society’s “real superheroes,” with images of Catwoman working as a nanny and Superman delivering pizzas on his trusty bike. The Bedford Gallery also commissioned an edition of San Francisco artist Lizabeth Eva Rossof’s Batman warrior in the style of a historic terracotta warriors from Xi’an, China. The show features nationally renowned Michigan artist Mark Newport who uses superhero imagery to explore issues of identity and the definition of a “hero.” And finally, San Francisco artist Jenny Ottinger beautifully sums up the superheroes hard day’s work with a series of paintings, quiet and gestural, showing a lone Superman suit retired to the hanger while our hero gets his much-needed rest. Rémi Noël, "Third Avenue, NY," 2005, photographic print. ​My Hero! studies our fascination with the astonishing and evolving characters that are woven into the fabric of our culture. Even though the superhero is complete fantasy, I think these characters resonate deeply because we all see ourselves in superheroes and their ability to do more than is humanly possible. And, there’s a lot of romance and familial strife in our superhero stories, too. Superman and Lois Lane, Spidey and his gal Mary Jane, and Batman with the loss of his parents and stolen childhood… We fall in love with the idea that there will be someone there to save us. And at the same time, we daydream about being the ones who do the saving. Every generation needs a hero. Through the eyes of contemporary artists today, My Hero explores the enigmatic and iconic world of superheroes, and the staying power of the extraordinary characters that inhabit this astonishing domain. Dulce Pinzón, Selection from "The Real Story of the Superheroes" series, 2005-2010, photograph: "Superman: Noe Reyes from the State of Puebla, Mexico. He works as a delivery boy in Brooklyn, New York, and he sends home 500 dollars a week."